The Robot Save Create Media Definition (RBSCRTMDFN) command allows you to create media definitions for parallel operations. You can perform save and restore operations while using more than one tape device simultaneously. 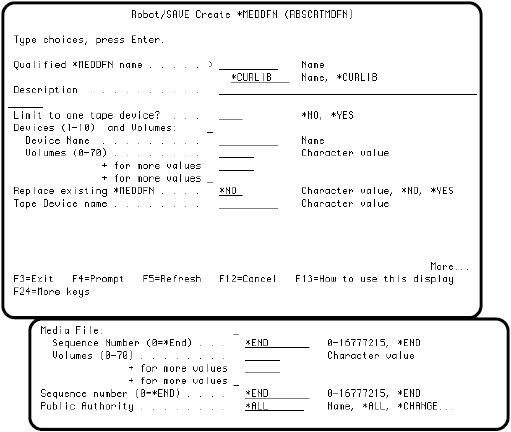 Robot Save uses an IBM API to create media definitions specifying the tape drives, volumes, and sequences needed to run the operation. Once the media definition has been created, you can specify it on save and restore library or object commands. You must have *USE authority to the media definition and *EXECUTE authority to the media definition library. You also must have normal save or restore authority for each device that is specified on the media definition. Enter the RBSCRTMDFN command on a command line and press F4 to display the command prompt panel. Complete the command parameters with the information to define the media definition you are adding. If you need additional information about the command parameters, press the Help key to display the command help. To see the information for a media definition, enter the RBSDSPMDFN command. 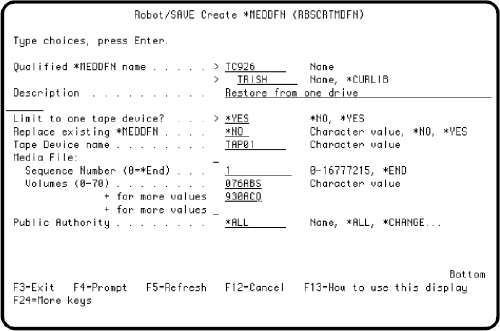 Robot Save can track the volumes and labels you save using ad hoc tape management. 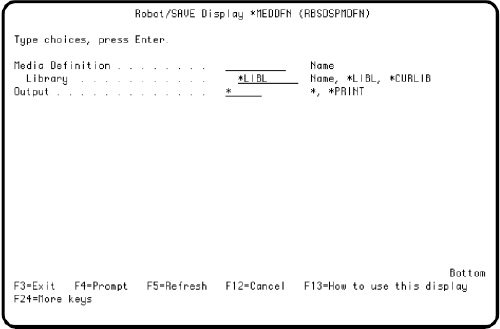 See the Robot Save User Guide for complete information on using ad hoc tape management. Also see the IBM Backup and Recovery Guide for more information. Note: You can restore from one tape device even if the save was performed using multiple tape drives. However, if you are restoring from one tape drive after having used multiple tape drives for the save, you must create a new definition for the drive you plan to use. When you create the new definition, you must specify the drive to be used and the volumes used in the original backup in the order they were used, as shown below.